The Chinese sequencing market is large, fast-growing, and dominated by brands from outside of China. BCC Research reveals in a new forecast that this market should hold great appeal for sequencing companies seeking strong growth and high profits in the next decade. Chinese sequencing companies rely heavily on the technologies and instruments provided by their partners in the United States and other countries. China’s 13th Five-Year Plan (2016–2020) targets precision medicine as a new focus for improving the country’s health and medical standards. As a result, the DNA sequencing market in China is expected to grow significantly during BCC Research’s forecast period. As of mid-2014, the Chinese government had approved only a few companies for providing noninvasive prenatal testing (NIPT) services to the Chinese market. In early 2015, the government opened the market to more companies and hospitals, leading to strong growth in the clinical sequencing market. In 2015, more than 140 companies were created in China for NIPT, cancer detection and diagnostics, microbiology, bioinformatics, and other sequencing applications. In September, China opened a national gene bank, which could eventually house 300 million genetic samples. The China National GeneBank (CNGB), based in Shenzhen, Guangdong province, has been dubbed “China’s Noah’s Ark” by the Chinese media. The billion-dollar center is the fourth national gene bank of its kind in the world, following similar projects in the United States, the United Kingdom, and Japan. It was set up by the Chinese government and the Beijing Genomics Institute. As of September, the CNGB had already collected 10 million biosamples, including a cancer database with 3,000 samples and information on 50,000 genome mutations. “We hope to make the gene bank China’s, and even the world’s, biggest biological information data centre, like Google but in the field of life and health data,” Mei Yonghong, director of the centre, told the Xinhua news agency. The gene bank will contain human, animal, and plant data, as well as living samples. 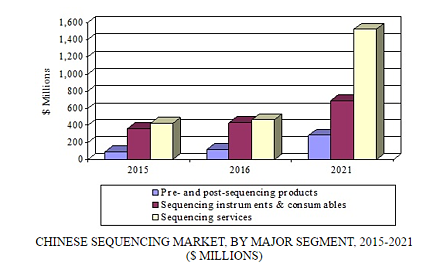 For its analysis, BCC Research considered the three major segments of the Chinese sequencing market: pre- and post-sequencing products; sequencing instruments and consumables; and sequencing services. Pre- and post-sequencing products cover both the front end (sample preparation) and the back end (bioinformatics) of the sequencing workflow. The Chinese sequencing market is expected to reach nearly $1 billion and $2.5 billion in 2016 and 2021, respectively, increasing at a five-year compound annual growth rate (CAGR) of 19.7%. Sequencing instruments, consumables, and pre-/post-sequencing products should grow from $546.8 million in 2016 to $976.6 million in 2021, demonstrating a five-year CAGR of 12.3%. As a segment, sequencing services should have the highest growth rate, with a five-year CAGR of 26.5%. Boosted by strong demand for NIPT, cancer detection, and other services, the sequencing services segment should reach $1.5 billion in 2021. As a sub-segment, clinical sequencing services for cancer should exhibit strong growth, reaching $437.1 million by 2021 at a five-year CAGR of 45.4%. Medical experts in China are starting the nation’s first genome research into congenital heart disease. They will look for genetic causes and environmental factors that cause the disease, with the aim of being able to detect it early so that precise treatment can be initiated. Congenital heart disease affects up to 200,000 children annually in China, accounting for more than 25% of the nation’s inborn congenital cases. It is also the top reason for child death and disability. Samples from a total of 2,000 patients and their parents, as well as 500 healthy people, will undergo full genome sequencing for comparative study to find mutated genes and risk factors during pregnancy, said experts from Shanghai Children’s Medical Center, which is carrying out the program. “The heart is the earliest organ formed and starts working during fetal development…any genetic mutation and risky influences from the environment can impact the heart’s normal development and cause congenital heart disease,” said He Lin, from the Chinese Academy of Sciences and the leader of the program. Indeed, Thermo Fisher has been putting emphasis on China. Last year, Thermo Fisher earned $1.4 billion in the Chinese market, which was approximately 8% of its total revenue. China is its second largest market after the United States. Thermo Fisher’s genetic analysis instruments are helpful to medical researchers who are studying genetic diseases such as cancer. Last year, there were 4.3 million new cancer cases and more than 2.8 million deaths linked to cancer in China. BCC Research’s new study, The Chinese Market for DNA Sequencing, analyzes the DNA sequencing market by product type, platform, customer type, value chain position, analysis type, and geography. Market drivers and trends, with data from 2015, estimates for 2016, and projections of CAGRs through 2021, are provided.